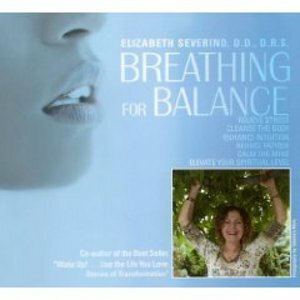 Breathing for Balance introduces the Energy Breath pioneered by best-selling author, Dr. Elizabeth Severino, and featured in major multi-national publications. The Energy Breath relieves stress, cleanses the body, enhances intuition, reduces fatigue, calms the mind, and elevates the spiritual level. It is also the breathwork the author uses to help keep herself highly intuitive and balanced in today's stress-full world. This 59:27 minute Audio CD, with beautiful, subliminal joy music in the background, includes an Introduction to the Energy Breath, a Quick Session of 100 Breaths, an Explanation of a Full Therapeutic Session, Preparation for a Full Therapeutic Session, and a Guided Full Therapeutic Session with Completion. Both animals and humans benefit from just listening to this CD! Dr. Elizabeth Severino, D.D., D.R.S., is a former Fortune 500 executive and best-selling co-author of Wake Up ... Live the LIfe You Love: Stories of Transformation. An internationally renowned advanced healing communicator for People and Animals, she is a true Renaissance Woman: an animal communicator since birth, she is also an intuitive advisor, lecturer, author, workshop leader, spiritual healer, poet, linguist, ballroom dancer, choreographer for both ballroom and opera, artist, singer, computer-whiz, and musician. Her accomplishments are chronicled in dozens of Who's Who books in the U.S. and elsewhere, including International Leaders of Achievement published in Cambridge, England.